Helping my client know if it is right for them. 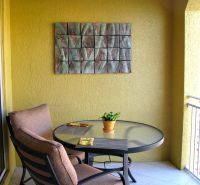 Tue, Nov 3rd, 2015 There's no better way to know if sculptural tile art is right for you than to see it in your home BEFORE you purchase it. 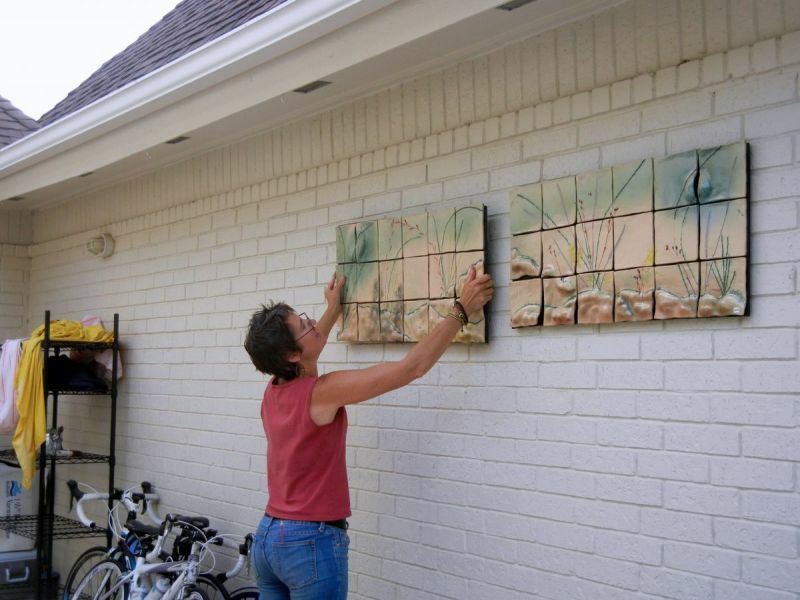 That's why I always offer free home showings to clients, whether at an art show or while I'm working in my ceramic studio here in St. Petersburg, FL. 1. It's simple and convenient. 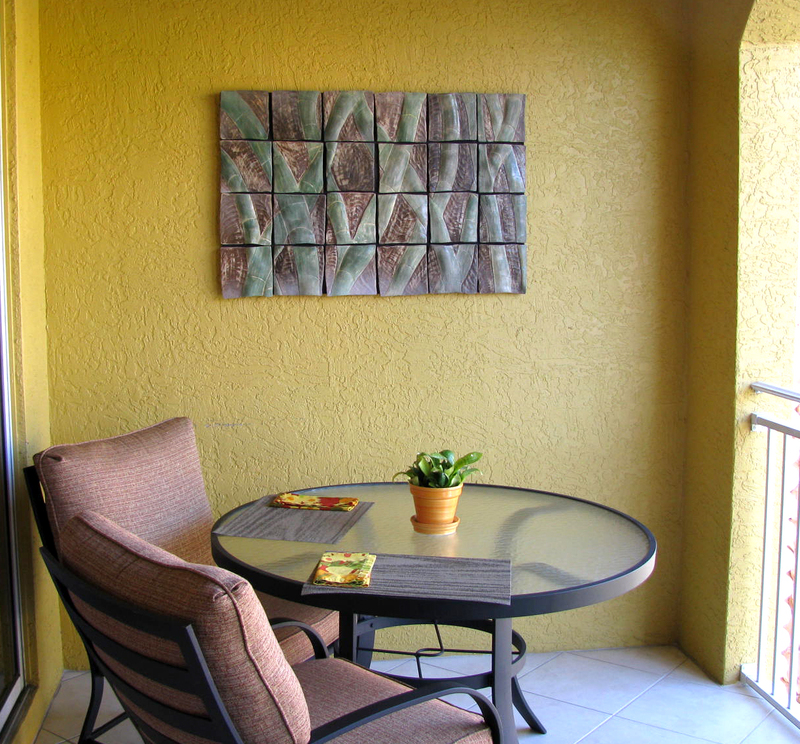 If you see some handmade ceramic tile art pieces you like, let me know. 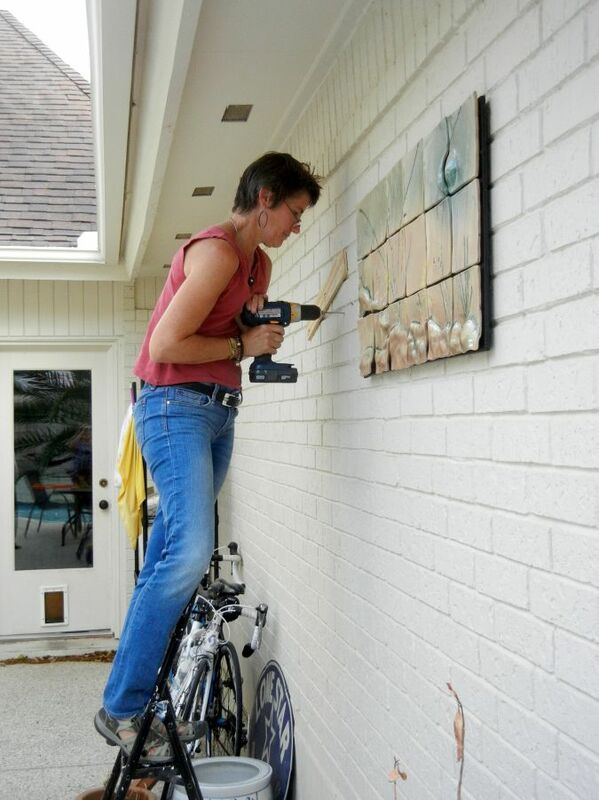 We'll schedule an appointment, I'll put the tile wall art in my truck and come to your home to see if they work. If you like the new wall art piece, I install it immediately. I always say, 'once you see the tile wall art in your home, you'll know it's the right one.' If it doesn't work, back in the truck it goes. No pressure, no strings attached. 2. You have choices. If you want to compare a few pieces, let me know and I'll bring all of them to you. If you try them and they just don't work - no worries. Maybe I can create a wall art sculpture just for you! 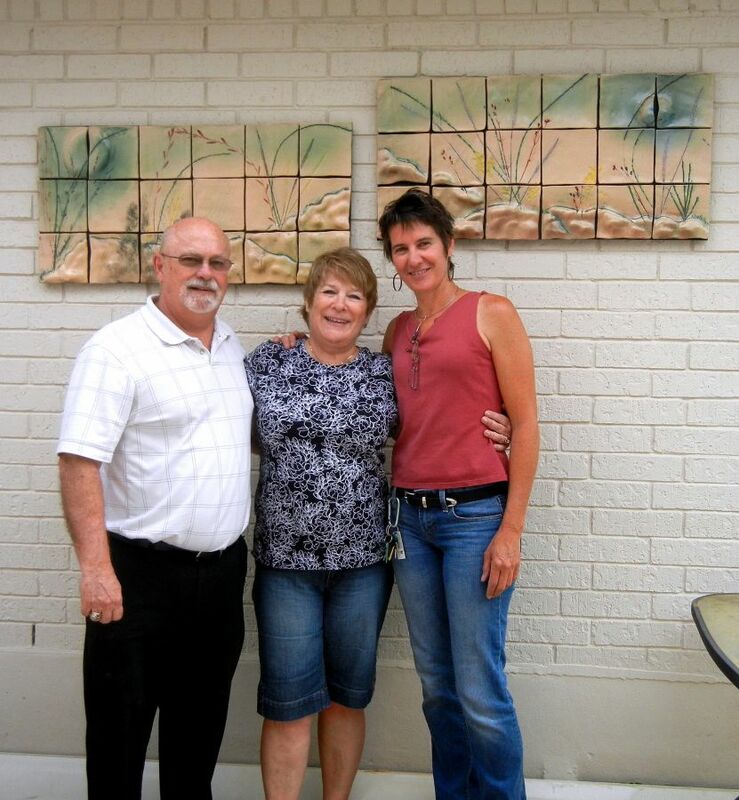 Here I went to Elaine & Larry's home in San Antonio, TX to try a few ceramic tile wall art pieces. They were thinking about one tile piece, but when they saw these two together they looked great, so we put them on the wall. Larry was a great assistant and Elaine was the photographer, extraordinaire! 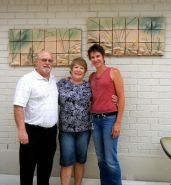 In Melbourne, FL Carol & Gary wanted to see 2 different handmade ceramic wall tiles. each of which were different sizes. 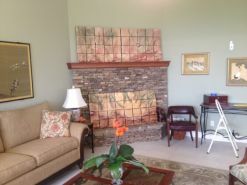 At first they both like one in my art show booth, but when I brought the ceramic tile art to the home and held them up, the alternative piece was a perfect fit. 3. Connection & Ideas. When I come to your home, I see your aesthetic, colors and design sense, it's easy for me to get a feel for what you might want. I can either pull some pieces out of the truck you didn't notice, or help design a perfect piece for that space that's calling for art. This Melbourne. FL couple made a decision between these two pieces while providing comfort for my then 12-week old puppy TY. 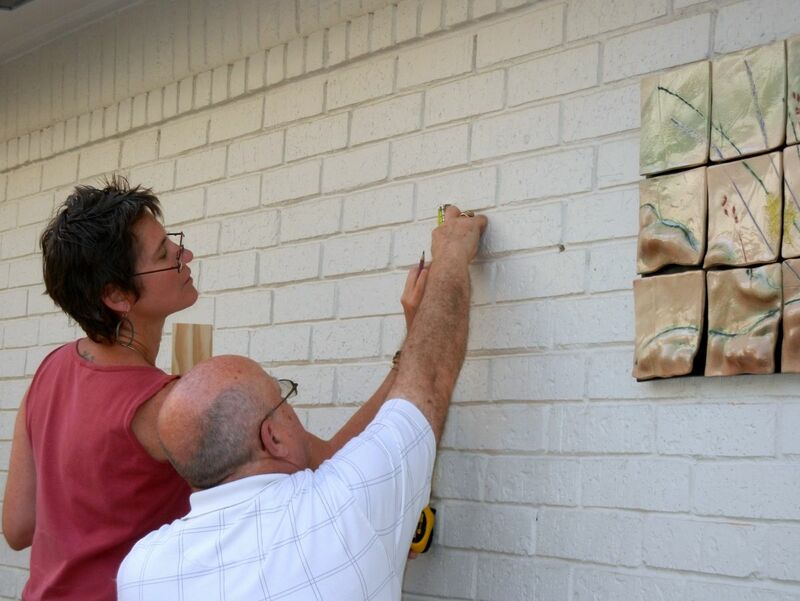 This Naples couple had me come by with one art piece, but after seeing their wall, I pulled this one out of the truck - it looked as though I had made it just for them! Private showings are wonderful for you and me. I do them all the time. It is a service I joyfully offer. If none of the pieces you see work for your home then I pack up and go along my way. In the end I provided a service you'll always remember and you have more information to help in selecting the perfect art for your home. As they say, it's a win-win. 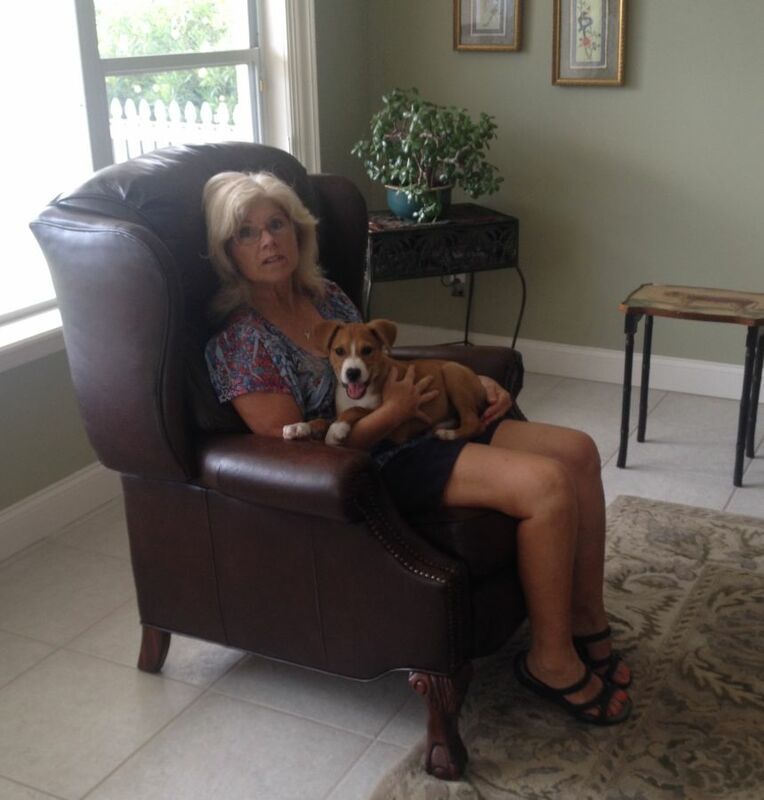 Contact me to begin a conversation about private home showings while I'm in your neighborhood. 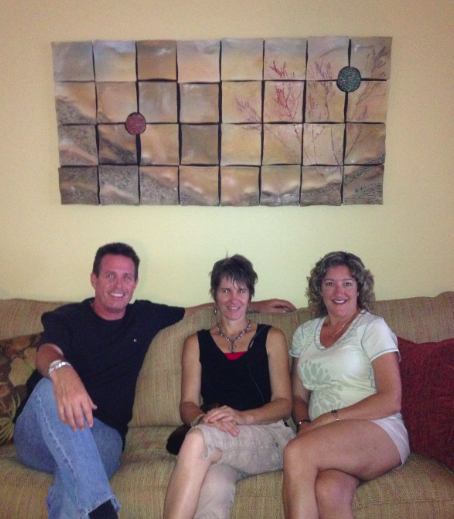 I work together with my clients to get them just what they want!